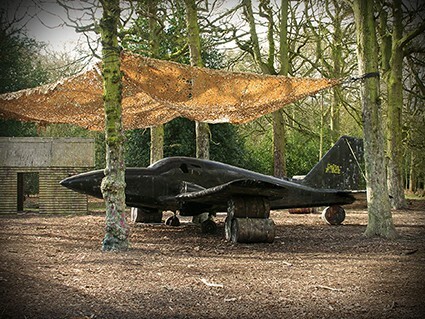 Delta Force Paintball Birmingham – Forts, pyramids, coffins and more! For those looking to play Paintball in Birmingham, Delta Force Paintball Solihull is the biggest paintball centre in the Midlands. 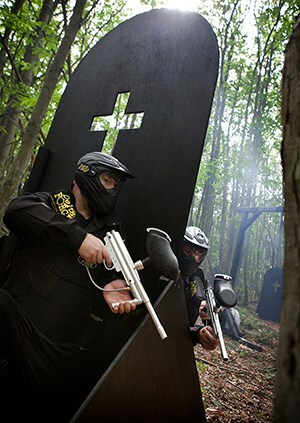 With a selection of 10 Hollywood-style game scenarios to re-enact in each of the individually themed game zones, it’s proved to be a popular choice among our paintball customers. Located just off the M42, the centre lies within 64 acres of diverse woodland; a gorgeous setting for an unforgettable day out. Suitable for both adults and children over the age of 8, it’s an outdoor activity that the whole family can enjoy. So, what can you expect from your day at Delta Force near Birmingham? Well, you may be sent on a drugs enforcement mission with your specialist unit where you’ll need to try and capture and detain an evil drug lord and one of the USA’s most wanted men in ‘Pablo Escobar’s Air Strip’! Or you could be selected by the State Department to protect the American president during his UK tour in our game zone ‘London Bus’, when you suddenly come under attack! Will you put yourself at risk in order to protect the president until back-up arrives? If trekking in the jungle is more your thing, you could be sent deep into the darkest rainforest in ‘Mad Murphy’s Jungle Attack’ where an allied airman has crashed and needs rescuing from his tangled parachute. Will you manage to find him before the opposition does…? If you’d like to experience any of these exciting game zones for yourself at Delta Force Paintball Birmingham, call the bookings team on 0203 869 9301and arrange a day of paintballing with us!